Took this picture around 35th Ave and Thunderbird a few days ago. . .
All right class, did anyone notice a problem with this sign? Yes, I know the kids these days for some reason find it appealing to replace "s’s" at the ends of words with "z’s." Zorro wanna-be’s, I suppose. I wouldn’t even pause to comment on it, except for the fact that they call themselves a learning center. Not a daycare center for preschool children that ends with the first day of spelling, not a become-a-hip-hop-star center, a learning center. 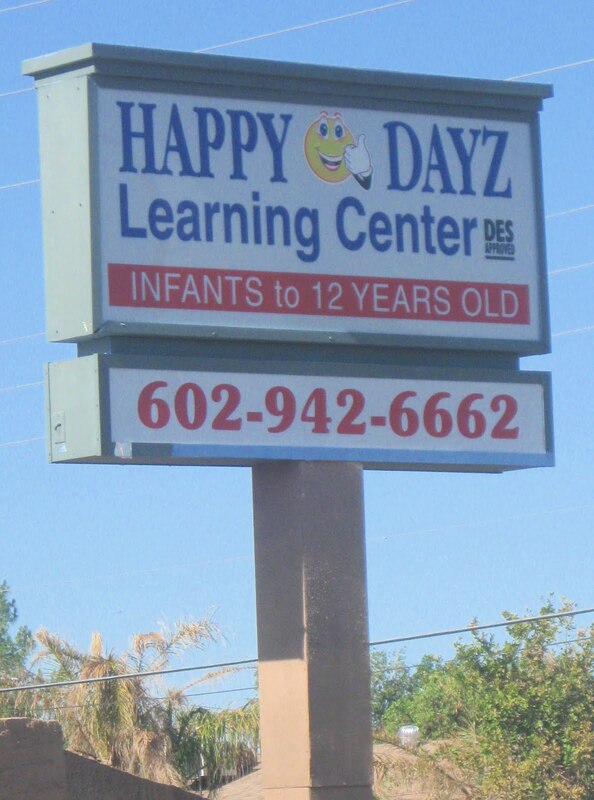 How much hope can you possibly expect to have for your child’s purported edification in a place that has chosen to call itself “Happy Dayz?” They might as well have gone the rest of the way, and called themselves “Happy Daze,” because I’m guessing only the parents who are in one will put their kids there.